[UPDATED July 27, 2016] Since 2010 apartments have performed very well across the nation. 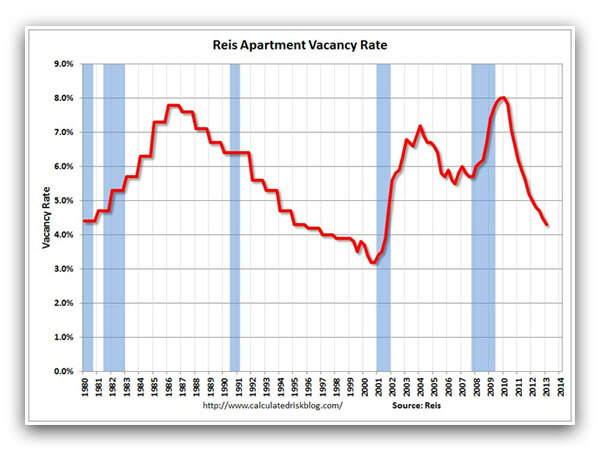 The following graph from REIS (courtesy of Calculatedriskblog), a real estate research service, shows the trend in vacancy rates for larger apartment communities. It’s clear from the graph that the market bottomed from an occupancy perspective in 2010. In 2009 and 2010 we determined that it was time to man up and get very aggressive about expanding our investment footprint. Our operating results confirmed our intuition as the 48 properties we had in our portfolio that we still own saw their revenues grow by 14%, Net Operating Income (Revenues minus expenses) expand by 20%, and cash flow before capital expenditures explode by 100%. Reis reported that the apartment vacancy rate was unchanged in Q2 2015, compared to Q1, at 4.2% – and also the same as in Q2 2014. As mentioned previously, vacancy rate peaked at 8.0% at the end of 2009. 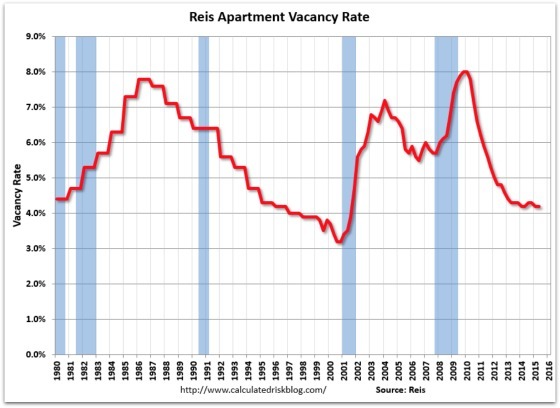 As this updated chart shows, vacancy rates are mostly moving sideways now. Vacancy is cyclical and moves in long phases. For most of the last five years, the market has been in a vacancy compression phase, falling from 8% at the start of 2010 before bottoming out at 4.2% during the first quarter of last year. However, since that time vacancy has been stuck at the 4.2% range for the sixth consecutive quarter. As you may recall, in my blog earlier this year I touched on the point that the rental market continues to remain strong as the vacancy rate has come down significantly from the peak for all forms of rental housing. I asked is housing under supplied, over supplied or in balance? Since this blog was published in 2013, what are your thoughts on the current Apartment Vacancy Rates?